One of the highlights of the summer season is the incredible bounty of fresh produce, and grilling these vegetables gives them a smoky, delicious dimension. Chef BBQ Naz, a grilling expert from Broil King, shares some simple tips for flavor perfection. * When preparing vegetables, slice them to expose as much of the vegetable to the grill surface as you can. 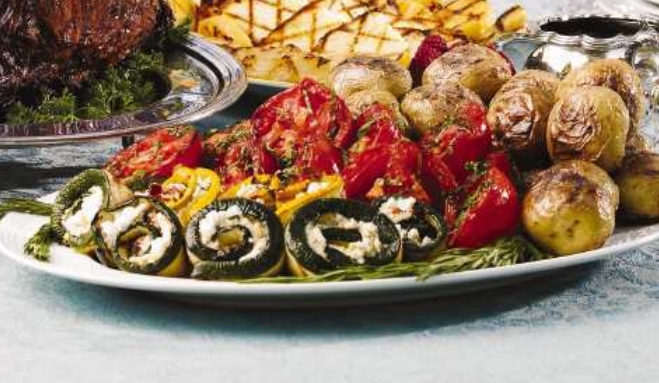 * Coat vegetables with olive oil before placing them on the grill. This will help prevent them from sticking to the grill. * Use the right tool for the job. Accessories like grill toppers and skewers are perfect for keeping smaller foods like cherry tomatoes and onions from rolling around or falling through the grate. * Don’t leave vegetables unattended. Vegetables are delicate and can easily overcook if not monitored. * Grill extras. Leftover grilled vegetables are great in soups, salads, sandwiches and on pizzas and pasta. When grilling vegetables, consider this popular recipe. Preheat the grill on medium. Brush both sides of sliced zucchini with olive oil and sprinkle with salt. Place on the grill and cook for 4 minutes per side. When cooked, set on a wire rack to cool. In a small bowl, combine the chevre, salt, pepper, sun-dried tomatoes, oil and thyme. Using a small spatula, spread the cheese mixture thinly over one side of the zucchini. Lightly roll the zucchini, and place seam side down on a small, parchment-lined baking sheet. Sprinkle with Parmesan cheese. Place baking sheet on top rack of the grill for 15 minutes. Remove to a platter and serve. Additional recipes and a complete vegetable grilling guide can be found at www.broilkingbbq.com.